Prior to his passing on November 17, 2018, Cyril was excited about planning the festival, performance line-up, beach clean-up. He was instrumental in selecting the T-shirt color representing the often seen Celadon Blue water of the Waimānalo coast. As a tribute to his late father, Cyril Pahinui initiated the Gabby Pahinui Waimānalo Kanikapila in 2007. Since then, it has grown to become one of Hawai’i’s premier celebrations of Hawaiian music. The Na’alehu Theatre, Pahinui Productions and Outrigger Resorts are proud to carry this unprecedented event forward to celebrate the musical heritage of Waimānalo, Gabby’s April 22nd, and Cyril’s April 2st birthdays. The festival is designed after gatherings remembered from Cyril’s childhood days, when weekends at the family’s home on Bell Street in Waimānalo were a continuous kanikapila. As in those days, the event attracts more than 100 musicians and gives thousands of fans an opportunity to witness some truly unforgettable moments, amazing performances, and one of a kind all-star jams by some of Hawai’i’s greatest musicians who get together to play music in the park. 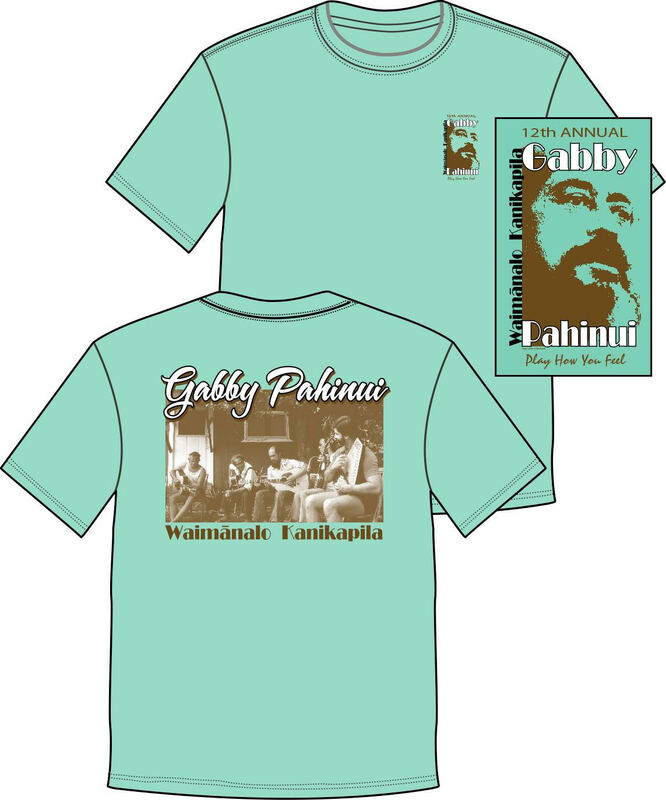 The Na’alehu Theatre, Pahinui Productions and Outrigger Resorts are proud to carry this unprecedented event forward to celebrate the musical heritage of Waimānalo, Gabby’s April 22nd, and Cyril’s April 21st birthdays. (For those who pre-ordered, please note the picture shirt design was changed as a special recognition of Cyril’s recent passing. The original design will be offered at a later time). The music was great and the day was enjoyed by all. A special Mahalo Nui to all of the (1400) volunteers who joined us for the massive clean up of Waimānalo Beach Hale,Beach Park and Pavilion, and the Beaches from Makapu’u to Bellows! Your kōkua, kindness, aloha and desire to help was unmatched. We could not have done it without you!